KOROLYOV /Moscow Region/, October 22. /TASS/. Russian cosmonauts Maxim Surayev and Alexander Samokutyayev have accomplished their extravehicular activity (EVA) tasks under the program of the International Space Station’s (ISS) Russian segment and returned to the ISS, the Moscow Region-based Mission Control told TASS. “The cosmonauts returned to the station and closed the hatches,” Mission Control said. 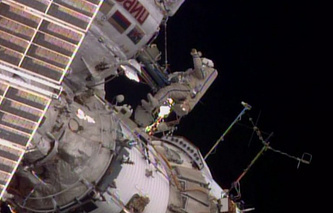 It said Surayev and Samokutyayev coped with their tasks way ahead of schedule and their spacewalk only lasted for about four hours although originally, it was to have lasted six hours. During the extravehicular activity (EVA), the cosmonauts performed the role of “space cleaners”: they dismantled the RK 21-8 radiometric system and the 2ASF1-1 and 2ASF1-2 antennas from the MIM-2 module. Besides, they fulfilled a number of tasks on the Expose-R and Test experiments and photographed the surface of the orbital station for specialists to assess its condition later. The EVA was the second for Surayev and Samokutyayev. The rest of the ISS crew - Yelena Serova, Alexander Gerst, Gregory Reid Wiseman and Barry Wilmore - met their colleagues inside the station. During the spacewalk, both cosmonauts worked in computerized Orlan-MK spacesuits with liquid crystal displays on the chest showing which systems and in what order should be monitored during EVA and what should be done in case of emergency situations.